This covered cup and saucer was presented by Maharaja Ram Singh ii of Jaipur. 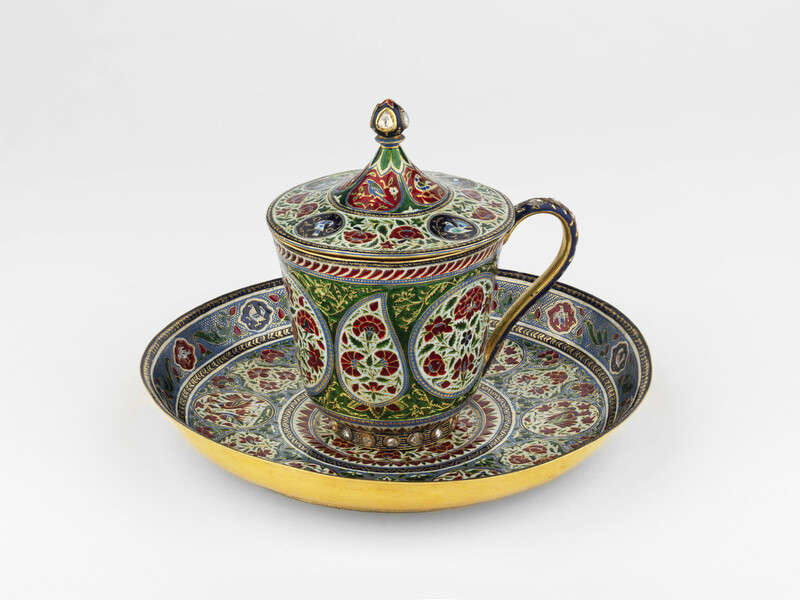 It is likely to have been enamelled by Ghuma Singh, who is recorded to have made a similar covered cup and saucer found in the collection of the Albert Hall Museum, in Jaipur, in 1895. Although intended as a Western drinking vessel, it follows the same form as covered cups and salvers traditionally used as perfume holders in India. This adaptation reflected the demand from the European market for Jaipur enamelling; in the 1880s a third of annual sales of Jaipur enamelled wares were made for Europeans. From the early twentieth century onwards, covered cups and saucers were often accompanied by similarly enamelled spoons.